Shirts With Random Triangles: South Carolina QB Connor Shaw eying military career post-football. 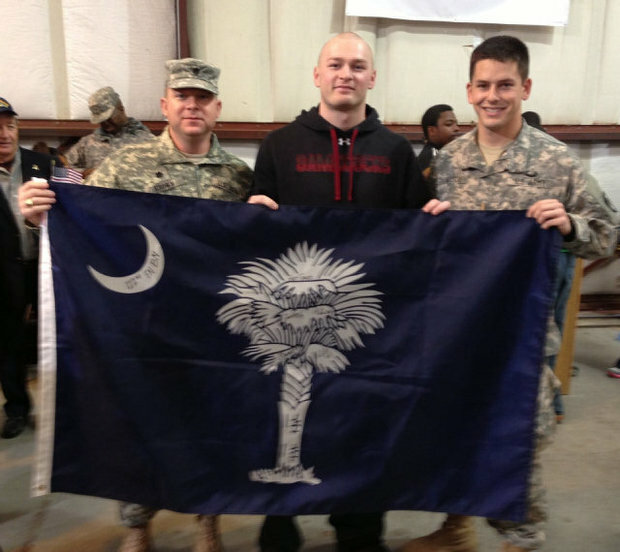 South Carolina QB Connor Shaw eying military career post-football. Connor Shaw (center). Photo via The State. South Carolina starting quarterback Connor Shaw is looking ahead to his future. And it's looking more and more like he may join the military once his football-playing days are done. The son of a successful high school coach in Georgia, Shaw once planned on going into coaching as soon as his playing days were through. “I think I want to go into coaching eventually, but I have been so passionate about the military,” he said. “I think it’s just the discipline, the strict regimen and structure, very similar to what is going on now. I am the type of person that I really honestly don’t know what I would do with free time. There is something about being part of something bigger than yourself, very similar to a team. Shaw has been involved with Hidden Wounds, a South Carolina organization aiding military personnel and veterans dealing with post-traumatic stress disorder and brain injuries.